Sober Look: Risks of Abenomics "stalling out"
Risks of Abenomics "stalling out"
This coming Thursday Japan's Ministry of Public Management will be releasing the January CPI figures. The report will be closely watched to determine the progress of "Abenomics", as the nation tries to work its way out of the persistent long-term deflationary environment. However, a number of analysts continue to be skeptical of Abenomics succeeding. 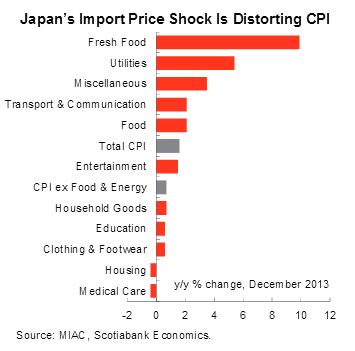 Derek Holt/Scotiabank - Here comes another round of Abe-hype, only this time, CPI inflation is expected to fall from the recent 1.6% y/y peak and that would further feed impressions that Abenomics is stalling out. 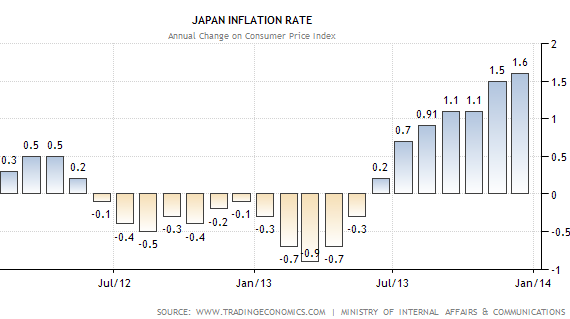 The upturn in CPI inflation by December was still being heavily influenced by utility prices that were up 5.5% y/y due to the effects of yen depreciation on imported natural gas and oil prices, and higher electricity prices in the face of Japan’s continued shutdown of all of its nuclear reactors. Take energy and food — which is also probably under upward pressure in part due to yen depreciation — out of CPI and it is only up 0.7% y/y as food prices themselves are up 2.2%. Most of the CPI effects of the Bank of Japan’s efforts to depreciate the yen remain confined to a relative price shock to food and energy that crowds out spending power elsewhere in the economy on future second-round effects in the absence of a pickup in wage growth or credit access. In spite of high expectations, the boost to exports generated by weaker yen has been more than offset by the rising value of imports (see chart). With the sales tax hike looming and wages remaining stagnant, the risks of Abenomics "stalling out" remain high.